After tension broke out at Ward 350 of Evin prison, special guards units were sent to the ward and 10 political prisoners were moved to Ward 240 solitary confinement on the direct order of Tehran Prosecutor General. 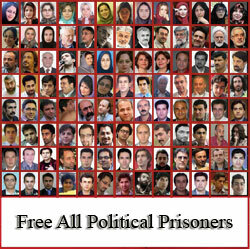 Political prisoners Saeed Madani, Abdollah Momeni, Abolfazl Abedini Nasr, Siyamak Ghaderi, Amir Khosro Dalirsani, Mohamad Hassan Yousefpour Seifi, Saeed Abedini, Kamran Ayazi, Mohamad Ebrahimi and Poriya Ebrahimi were all moved to solitary confinement after protesting the Deputy Warden demanding the dismissal of Saeed Madani as the representative of Ward 350 political prisoners. Following this illegal demand by the Deputy Warden, prisoners protesting this illegal order, and in support of their chosen representative, chanted slogans and sang anthems in the public area of the Ward. The prisoners were demanding the dismissal of Deputy Warden Momeni, and halting of his interference with the Ward 350 affairs. In recent weeks, Ward 350 prisoners’ representative, Saeed Madani had voiced prisoners’ complaints regarding the inappropriate treatment of prisoners, the state of the prison store, it’s financial mismanagement and irregularities, and repeated insults by officials in the visiting room. According to the latest report, these ten political prisoners, in addition to being placed in solitary confinement, are now also banned from visits. These prisoners have threatened to launch a hunger strike if the situation is not remedied. All other political prisoners have also threatened to stop going to the visiting room if this situation continues as is. The Prosecutor General’s representative and officials from the Intelligence Ministry were present at the meeting between the prisoners’ representatives and the prison officials and explicitly said that the Prosecutor had ordered the protesting prisoners be punished. Wife of deceased political prisoner Mohsen Dogmechi has been summoned by the prosecution to serve her 3 years sentence which was upheld by the Appeals Court. Maryam Aldangi was sentenced to 3 years imprisonment by Branch 15 of the Revolutionary Court presided by Judge Salavati. Her sentence was upheld last year by Branch 36 of the Appeals Court presided by judge Zargar. Maryam Aldangi is the widow of prominent Bazaar businessman Mohsen Dogmechi. He was arrested on September 7, 2009 on charges of giving financial aid to the political prisoners’ families and was sentenced to 10 years imprisonment. Dogmechi became ill with pancreatic cancer while imprisoned, and due to lack of proper treatment in prison and delay in being sent to a hospital, died March 29, 2011. October 2009, about a month after her husband’s arrest, Maryam Aldangi was arrested at her home. She was released on bail after 70 days of interrogations and pressure in solitary confinement in the Intelligence Ministry’s Ward 209 at Evin prison . After her husband passed away, she was summoned by Branch 15 of the Revolutionary Court for holding funeral services for her husband and giving press interviews. She was arraigned on the same charges as her husband’s charges. The court issued it’s ruling for her based on these same charges. According to the summons she has received, she must report to prison on May 1 to start serving her sentence. On day 110 of dissident blogger Dr. Mehdi Khazali’s hunger strike, a number of political activists visited with his wife. In this meeting, Dr. Khazali’s wife questioned the silence from the Grand Ayatollahs and the senior members of the clergy on her husband’s situation. She also indicated that even the short phone calls from her husband are getting shorter with by the harassment and interference from the agents. Mrs. Khazali describing her husband’s health situation said, “His physical condition is very alarming and dangerous. According to my husband, in our last phone call, he said that, due to severe weakness and low blood pressure, he has fallen twice, suffers from shortness of breath and, with a history of heart disease, he needs to hospitalized and placed under special care at a CCU. In response to how long this hunger strike is going to last, she replied, “My husband is a religious man, a revolutionary, a free minded man and has an iron will. My husband is a man who performed his duty selflessly during the war as a radio-man in the front lines. At that time with radio in hand he guided his comrades by pointing out their weak points and pointed out where the aggressors were attacking from. Today, as he said himself, he is performing his duty on a different front. Even though I have repeatedly told him that they can not tolerate his critical writings, have deprived him of his basic citizen’s rights, and have repeatedly imprisoned him, but he saw it as his duty to write. Just as he did before, he put on his war uniform and wrote with his pen as his weapon, and he wrote and wrote and wrote. At the end of this meeting, Mrs. Khazali read a letter she had addressed to the Grand Ayatollas, the senior members of the clergy, religious scholars and the jurists. Grand Ayatollahs, the senior members of the clergy, religious scholars, the jurists, the noble people of Iran, authorities, government officials and the people in power: I, Dr. Mehdi Khazali’s wife, am a descendant of the celestial Lordship (the Prophet Mohamad), descendant of Fatemeh Zahra and Imam Ali. The Fatemeh who is the personification of Kausar Surah (Quran, Psalm 108, “The Abundance”, name of a fountain in Paradise), Ali Morteza, the example of piety and virtue, the one who pulled a thorn from a Jewish woman’s foot and said he deserved to die for the injustice inflicted upon this woman. I declare, that my husband’s life is in danger. This great man is nearing martyrdom. I am baffled that the authorities are aware of this and do nothing, and the Grand Ayatollahs and Jurists have only become spectators and remain silent. Whoever slays a human being, unless it be as punishment for murder or spreading corruption in the land, it is as if he had slain mankind entirely. And whoever saves a life, it is as if he had saved mankind entirely (Quran, Psalm Maaedeh verse 5.32). The honorables and the dignitaries, what if we remain ignorant and silent and a great man loses his life, and then we become aware and repentant? Today, with tears of blood, I shout my husband’s innocence, just as my mother Fatemeh Zahra did. I shout and wail. Just as my Ladyship did, I beat the door of each and everyone of your homes and will narrate our grievances. Perhaps one of you will seek justice for the oppressed from the tyrant. Dissident blogger Dr. Mehdi Khazali, on day 107 of his hunger strike, is still incarcerated in the high security Intelligence Ministry’s Ward 209 at Evin prison. Dr. Khazali launched his hunger strike in protest of his illegal arrest and detention, and has vowed to remain on it until released from prison. “Thursday April 11 we went to visit with my father. When, after two weeks of anxiety and stress, you go for a visit and you know that your dear one is on a hunger strike, and don’t know how he is doing, you become more sensitive to anything that occurs prior to the visit. And after a bit of hesitation, as we look at him, thinking a thousand thoughts that something may have happened (for we know that there have been cases in the past when the family was notified days later). They then took us to visit my father, where we sat and see my father from behind the glass window and observed how each time he becomes weaker, and how difficult it is to see my father wasting away…. From afar, father was coming with a guard firmly holding his hand so he could walk. As he was getting nearer, at each one of the steps he took, it was as though my heart beat was injecting life within my being. When you see your father shivering from being so weak while you know he is as warm as the sun and as strong as Damavand mountain and you know he will never succumb to tyranny. When we ask him to break his hunger strike telling him it is not good for his health, he answers, “I will stand till the end”. He deplores enslavement, and seeks liberty. When I tell him that, those who consider themselves revolutionaries and loyal to the system, call you an anti-revolutionary who seeks to overthrow the regime, and those who are anti-revolution and want to overthrow the regime, consider you loyal to the system and the revolution. Each group, with it’s own beliefs, attack you, and only thing that seems not to have any value here is the lives of human beings. Those who claim that they can’t even hurt an ant, say; “Let him die”. Many of the revolutionaries do not know that there is no one more revolutionary than you. And many opponents, calling themselves intellectuals and claiming freedom of speech and thoughts, oppose your notion to support the system and the revolution, even at the cost of the life of an innocent human being. In your father’s home, they have created such an atmosphere as though you are an infidel deserving to be fought against, for they think you have raised your sword against Islam, God and Quran. They have spread lies and falsehood among the people as though you are in a seven star hotel in Evin, enjoying luxury and having a merry old time, and are laughing at them. Among your friends and acquaintances, they have done things to make them either nervous to say anything or have believed the lies the interrogators have told about you: that you were making easy money through your connections in high places and living a good life, and only became a critic after your means of easy income were cut-off. One of your friends, who was arrested with you and was in Ward 209, after he was released, totally forgot about your friendship and carried out the interrogators’ orders by spreading lies about your wealth inside Iran and abroad, and many other false accusations that they have no problem in making, all paved the way for his case to be closed and not prosecuted. What else can I say….. Despite all of these, you still say you are standing firm till the end. I now have a question for you dear father, I am young and inexperienced but you are a vast endless ocean. I ask you for whom are you doing this? You are prepared to give up everything (your wife and children), when you could have reached high places and high positions that your brothers could not have even dreamed of. Because they did not have your education, your experience nor your potential, they have only reached high places because of my grandfather’s position (Ayattollah Khazali). To the best of my ability, I know God. I ask God to make me comprehend your ideology, for I still do not comprehend this ideology or that how far one can be loyal to an ideology. I wasn’t there during the Revolution, I have only heard about it from you and your memories of my martyred uncle. But I can understand the people. I do not want to resort to the Karbela and Kufa story (the battle of Karbela where Imam Hossein was killed by Yazeed and the people of Kufa despite their promise to support Imam Hossein betrayed him). But, some that used to be your close friends, now make me resort to the story of the people of Kufa. If you are doing this for the people, it seems to me that, to change a society, the people must first change themselves. They pre-occupy the people with poisonous propaganda. Unfortunately, the people themselves are not really after the truth, and (they) have pre-occupied them with the hardships of daily lives. In a show of support, a number of the Writers Association members and friends of Dr. Mehdi Khazali launched a hunger strike on Monday April 8, 2013, coinciding with the 100th day of Dr. Khazali’s hunger strike. A political venue can only be acceptable if it has not surpassed the realm of humanity and still upholds the true meaning of ethics and the human rights. 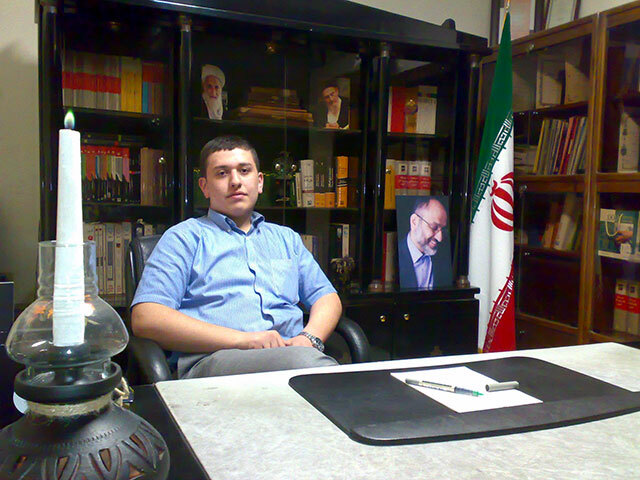 At this time, it has been 100 days and nights since the start of the struggle of our friend and compatriot, Dr. Mehdi Khazali, who, based on his beliefs, began his hunger strike. Dr, Khazali, a veteran of the Holy Defense war, and the son of Ayatollah Khazali (a former member of the Guardian Council, and a current member of the Assembly of Experts), following the example of his exalted Lord and Master, Aba Abdoulah (Imam Hossein), and to obtain his basic incontestable rights against the cruel oppressors, has had to resort to using the last bullet in his weapon. This veteran of the Holy Defense war, who sees hunger strike as the last resort of the oppressed in the pursuit of their inalienable rights against the oppressor, is spending his 100th day of hunger strike in a small damp cell with a Somali pirate cellmate. 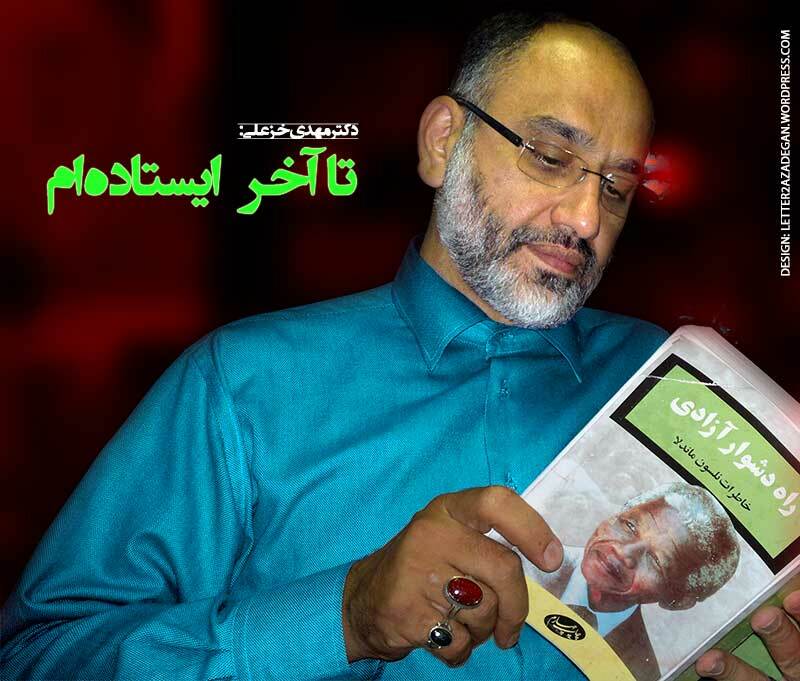 We, a number of friends and supporters of Dr. Khazali and a number of members of the Writers Association, announce launching a hunger strike as of Monday, April 8, 2013 in support of Dr. Khazali. We will continue our hunger strike until such time that we receive reliable news of Dr. Khazali halting his hunger strike. It is hoped that the authorities respect the rule of law and stop the detention of this noble Green activist who’s release order was issued two months ago. We, the undersigned, considering the grave health condition of Dr. Khazali, ask all the kindhearted people and the human rights organizations to pay attention to and address this issue. Considering his illegal imprisonment, we also feel that the responsibility for any consequences of this prolonged hunger strike, lie with all who have heard the voice of the oppressed asking for his rights but did not act, and perform their duty in this urgent matter. Yesterday evening my dad called, but before he had a chance to say anything, the phone was disconnected. Five minutes later he called again. His voice seemed weaker and strained. He said he had been taken to the medical clinic at Evin with blood pressure at 5 and heart rate at 37. An IV was administered. The amount of hardship and torment that he suffers could be heard in his voice. I wish I could describe the tone of his voice! Under these conditions even a healthy person should be admitted to CCU, much less my dad who had suffers from a heart condition. But apparently they wish something different for my dad. My father spoke with that same sense of duty that he felt while fighting in the trenches of the war zone. He always spoke of a sense of duty (we must perform our duty). Those unassuming men that, for the 96 months of the Holy Defense, gave of their lives and wealth, so injustice does not become prevalent over the people. I emphasize that all the officials are aware of my father’s case and condition. Yes, all of them, without any exception. They have once again changed my father’s cellmate. They have now placed a Somali pirate in his cell. The responsibility for my father’s life and well being lies with all the officials who are aware of his condition and deliberately are not doing anything. My apologies to everyone for keeping them worried. I’m sorry for the delay in reporting his condition. Much gratitude and thanks for all your support and kindness. In my father’s previous contact, he spoke of inviting Mr. Hashemi Rafsanjai to become a candidate for the next presidential election. He said Mr. Hashemi’s presence is the way to save the country from the dangers. I’d like to make a confession. When I see the pain in my sisters’ and my little brother Ali’s eyes, and see the tears of my mother, I become very weary and skeptical and many other things become meaningless for me! At that point, I ask God to give me the strength to comprehend how one can remain loyal to their ideology, even under such harsh circumstances.